Tie Sing was a frontier baby, born high in the mountains in Virginia City, Nevada. America was a tough place to be Chinese when Tie Sing was growing up. Chinese workers were paid less than white workers, and many people with Chinese names ended up cooking in restaurants or working in laundries. But Tie Sing had BIG dreams. He got a job cooking for mapmakers as they explored and mapped the Sierras. And he got a reputation as the best trail cook around. 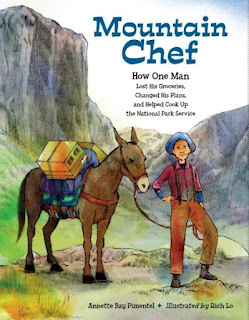 So when a party of Congressmen and others who interested in creating a National Park Service hired him as their trail cook, Tie Sing wanted to fix them meals that would make them remember the beauty of the peaks. No s'mores for this crew; it was English plum pudding with brandy sauce, eggs for breakfast, box lunches, and sourdough starter in the saddle bags for dinner loaves. What I like about this book: I love camping and hiking, and the National Parks! I enjoyed Annette Pimentel's depiction of Tie Sing - he really worked hard to plan menus and pack ingredients. I like that she shows a typical day in the life of a trail chef. And that she includes the obstacles Tie Sing has to overcome - like when a mule wanders away with the food and he has to improvise a simple (yet elegant) meal. The words and illustrations take us on the journey with Tie Sing. I also like the back matter - and there is plenty: information about immigration, how Tie Sing kept his food from going bad, and short biographies of the people who went on the expedition. End papers feature maps of the journey. Make some granola for your next camping trip; it also makes a good "carry along" breakfast for when you're traveling. Learn more about our National Parks - and if you have the chance to visit one, do it. Take a virtual hike up Sing Peak - here is a map, and wonderful photos of what you would see if you were hiking there. During a rest break - while you catch your breath - read up on the history of Tie Sing and the adventurous Mather Party. Today is PPBF (perfect picture book Friday), an event in which bloggers share great picture books at Susanna Leonard Hill's site. She keeps an ever-growing list of Perfect Picture Books. Review copy from the publisher. This is so cool. I have stayed in Virginia City. I love Sing's adventurous spirit. I didn't know how involved immigrants were in the development of national parks. Thanks for including the virtual hike up to the peak at Yosemite named after Tie Sing. So interesting how he kept meat from spoiling and the grand spreads he cooked for congressman. Wow, what a story. One of my favorite nf books of the year. So refreshing to learn about those whose contributions to our nation have are as important as famous leaders we know a lot about. Tie Sing's menus sounds amazing. Plum pudding with brandy sauce = yum! This sounds like a very interesting book. I don't like camping -- haha -- but I do enjoy immigrant stories.